Update: This fantastic exclusive deal just got even better - Vodafone has just completely got rid of all upfront costs. So now you can get fibre broadband for £21 a month with a £20 Amazon.co.uk Gift Card and NOTHING to pay at the start. Brilliant! Whatever the reason you've decided on fibre, now is a very good time to be on the hunt. That's thanks to an exclusive tariff we've bagged from Vodafone on its already-cheap fibre broadband deals. For the next week, TechRadar readers will also get a £20 Amazon.co.uk gift card when you sign up. You have a choice of two plans. 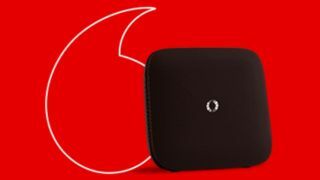 The first is Vodafone's mega cheap Superfast fibre broadband for a mere £21 per month. With a minimum speed guarantee of 25Mb, it's one of the cheapest fibre deals out there. And if you consider the £20 gift card, then the effective monthly cost comes down to less than £20 a month! Got a household of greedy internet users or can't get enough of 4K video streaming? Then it may be worth paying an extra fiver a month and cranking the speed up to an average of 63Mb. That's the equivalent download speed of almost 8MB per second.